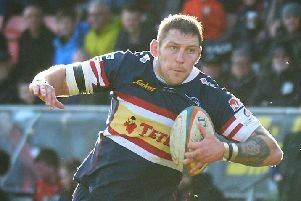 Doncaster Knights maintained their bright start to the 2018-19 Championship campaign with a 28-17 win over Richmond at the Athletic Ground. “We knew that it would be a tough game, and it was. They played pretty well,” said head coach Glen Kenworthy. Knights were forced to make a late change at half-back when fly-half Charlie Foley picked up an injury in training on Friday and with summer signing Kurt Morath also ruled out, they had to play dual-registered Cameron Cowell alongside Tom James. “Cameron stepped up and did a job for us in what is a key role but he’s better for us at full-back where he has been class in the two previous games,” said Kenworthy. The game saw full-back Paul Jarvis and wing Curtis Wilson make their first appearances of the season following hamstring injuries. “They both did okay and created some opportunities,” said Kenworthy. “The problem was that we didn’t capitalise on our chances and that’s something we need to work on. “They also failed to capitalise on some good positions but whereas we bombed our chances I think we stopped them with good defence. “Although they scored a first-minute try we didn’t panic and we were in control for large chunks of the first half and were unfortunate to be 14-13 at the break. “But, as I said, we didn’t take our opportunities apart from the Ben Hunter try when it was 14-6. It was an important try because we needed to score some points and convert our chances. “We didn’t panic at half-time and we (the coaching staff) just wanted the players to tidy things up in the second half. “The second half was a tight affair but had we taken a couple of dead cert opportunities in the first five minutes we might have got away from them. “But we didn’t take them and we found ourselves 17-16 down when they kicked a penalty on 68 minutes.